$52 $60 a year ($4.50 $5.00 month) - 100 minutes, 100 texts and 500 MB of high speed data. $88 $99 a year ($7.50 $8.25 month) - 500 minutes, 500 texts and 500 MB of high speed data. $205 $299 a year ($18 $25/month) - unlimited minutes, texts and 1 GB of high speed data. $360 $540 a year ($30 $45/month) - unlimited minutes, texts and 4 GB of high speed data. $62 $85/90 days ($21 $29/30 days) - unlimited minutes, texts and 1 GB of high speed data. $119 $150/90 days ($40 $50/30 days) - unlimited minutes, texts and 4 GB of high speed data. All plans are available on your choice of Red Pocket's four networks. Free SIMs for GSMA (AT&T), GSMT (T-Mobile) and CDMA (Verizon) are included with the purchase of any of these plans. For CDMAS (Sprint) you need to use the SIM that came with your Sprint phone. Shipping is free. I don't know how long this sale, will last but it probably won't be long, Red Pocket's flash sales typically only last for a day or two. By saying x amt. of high speed data, this implies "unlimited" throttled data? The plans are all hard capped. If they included unlimited throttled data, they would have been listed as having "...unlimited data, first N at high speeds. Typo: The $88 plan includes 500MB of data. Do you have to use the one labeled "renewal" for an existing line. Note that the "renewal" one is more expensive ($99). Also, if you purchase one of these for the existing line how long do you have to apply it? I fixed the typo, thanks. I'm don't know if you can use the regular kits for a renewal or how long the plan PINs are good for. Message the seller on eBay, he's been pretty responsive. Can I use 200 minutes of talk and zero texts on the $52 annual plan? Or its 100 minutes and 100 texts and 500 mB, without the ability to go and take the texts to the talk? In whatsapp, each MB gives about 5 minutes of talk. So 500 megs will give about 2500 minutes. I do not know how much data a call on hangouts will need. But if it is similar, so, this 500 megs will help out tramendously. But aa we all know you will not get one app to only be able to use the data and not have the other apps use the data. But at least it should give a 600 minutes of talk and many many texts on whatsapp. I do not know how much google voice uses for text and how much does google hangouts use for VOIP. The $52 plan includes 100 minutes period. You can't trade texts for minutes. Google Voice SMS use less than 1 KB each. MMS depend on the size of the attachment. Do the 90 day plans renew every 30 day, or is it a roll-over thing like TracFone? The 90 day plans renew every 30 days, there's no rollover. Amazing how fast prices have fallen, $52 for an entire year (500mb a month) when that used to cost $52 a month! They can't be making any money on this, I guess they'll make it up in volume. A few of these plans are leaving some ARPU on the table, sure, but there's plenty of profit to be had at $8 - $21(!) / GB of data. I'm pretty sure the bulk price of data is in the $1-2 / GB range since single line / retail customers can achieve that without too much hassle at Cricket or Metro. 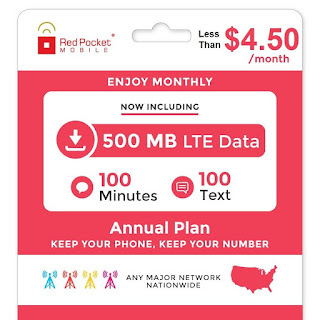 I am really liking these Red Pocket prices if nothing else but to have a phone on EACH network in case BIG RED gets obliterated by NOKO or whatever for a day or so. wouldn't Verizon and ATT make the most sense for this deal. Mintsim would save money with Tmo. Depends on what you want and need. Vow mobile data is throttled here. AT&T won't let you configure MMS on iPhones with Red Pocket. I can use all 4 networks and Tmo is the fastest where I go. Easy for me to choose Tmo for my iPhone. DoD just awarded Tmo a contract worth ~$200M along with AT&T and Vzw. The contract is worth up to $993.5M with option years. DoD thinks Tmo coverage is good enough and will get even better. Amazon has the yearly $204/1GB every day price. And $255 for 3Gb. If you search "red pocket mobile" on amazon. I am interested in trying on AT&T but the reviews on Amazon aren't so good. Thoughts? Boost and Virgin Mobile have online call logs. Not on Verizon Prepaid ? Verizon phone selection is lacking, and Metro is a better deal for higher (and more flexible) data usage. 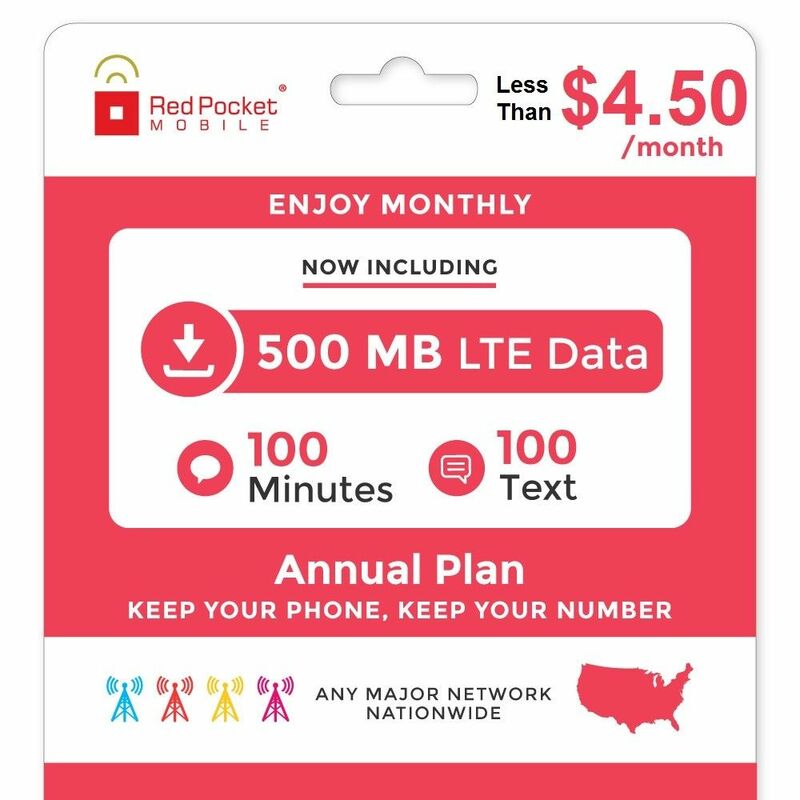 Personally I think Red Pocket has some of the best deals in wireless service. However. they do not offer call forwarding which is a deal breaker for me business wise. If using google voice, that can give you the call forwarding that you need. No? You can forward your Google Voice number to your Red Pocket number. If you are using you Google Voice number as your phone number that's all you need. You can't forward your Red Pocket number to Google Voice number so if you are using your Red Pocket number as your main phone number you can't use Google Voice for voicemail. I use Red Pocket on Verizon for continues two years(almost). It works great with the Motorola Droid Turbo 2. Forwarding to Google Voice number has no problem. It should forward to any numbers. I tested two numbers without problems. I have the $60/1year plan. I am currently on ATT. Can I switch to TMobile, or do I have to wait untill my 1 year is up before switching? Why do you want to switch from ATT to TMO? You can switch networks at any time by swapping out the SIM, but I don't know if one network's airtime (i.e. 5 months left on ATT) I don't know if the five months will switch to (say-TMobile). If this were TracFone, they wipe out your accumulated min/texts/data when switching from one network to another. I don't know what Red Pocket's policy is on switching networks with same phone. But NO you do NOT have to wait until your year is up as there is NO CONTRACT. Let us know what happens when a future Red Pocket article comes out again here. "If this were TracFone, they wipe out your accumulated min/texts/data when switching from one network to another." That's absolutely not true! I've done it myself with no problem several times. With TracFone, it's a good idea to use chat and have them confirm your balances (talk, text, data) and service end date before any transfer and then get the transcript sent to you in case anything goes wrong with the transfer. Also copy/paste the chat into notepad and save it in case the transcript is not sent. I think you can. I transferred from ATT to Verizon after 2 month of using the 1 year plan, just called customer service. you changed network in the middle of the 1 year plan ? did they collect any fees ? I called a few times but it never go through. I made a request on goredpocket.com and no one bother to respond. I tried again using online chat this time and a lady transfered me from Verizon to AT&T. This is 5th day into the plan and I am surprised they can do this for me. Go Redpocket ! Red Pocket went and did it again. Their 1000 minute - unlimited sms - 1 Gb yearly plan just dropped to $165. That's just $13.75 a month! An unbeatable deal right now in my opinion. Got it from eBay and for the unlocked GSM phones only the GSMT SIM got activated on the $52 annual plan promo, no luck on GSMA SIM which was my first choice to use. The GSMA SIM looks like will work if you try to activate it later in any of their regular plans. Did anyone try their CDMAS or CDMA SIMs on this promo, any luck or problem? The $52 plan works on all four carriers. If RedPocket couldn't activate the AT&T SIM, I'd ask them to send me a new SIM or a give me refund.